The University of Ulster is using its world-class business expertise to help local communities compete in an increasingly challenging economic climate. 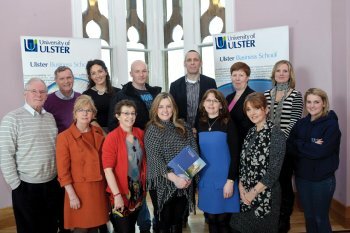 Launched by the Ulster Business School at the Magee campus, the Community Business Academy is a unique initiative that will give groups in the north-west the chance to work with university experts, business mentors and role models. Dr Lisa Bradley, Head of the Ulster Business School at Magee, said: “The Academy is designed to bring the key skills of business professionals into the community, for the community. “Many local groups and individuals make significant contributions to their communities but with the addition of skills such as leadership, management, promotion and entrepreneurship they would be able to operate in a more efficient and effective way. “Academy members will have free access to workshops and expertise to support their existing community projects, up-skill their team, promote their activities and raise aspirations. Representatives from the Youth Independent Advisory Group, Inner City Trust, Longtower Youth and Community Centre and the PESP attended the launch and first introductory workshop of the Academy at the Magee campus this week. Dr Bradley added: “This is the first time that the Ulster Business School has embarked on an initiative that involves working with community groups. It is a unique and exciting pilot project that is being launched in the north-west and which we hope can be rolled out across the province. “Through this project the Ulster Business School will develop better relationships with local community groups and lend a helping hand to support the valuable work that they already do. We hope that it will be the first step in building long term links with Magee that could open up a world of opportunities. “Given the growth of the local social economy we would envisage the community voice being represented in our future course design so that we can produce graduates that will have an understanding of their business needs. The first step is getting to know them through our new Academy. Contact Dr Lisa Bradley at: l.bradley@ulster.ac.uk.